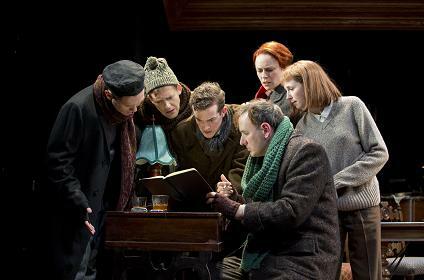 It Was Often Bleak at "February House"
Stanley Bahorek as Benjamin Britten,. Ken Barnett as Peter Pears, A.J. Shively as Chester Kallmann, Stephanie Hayes as Erica Mann, Kristen Sieh as Carson McCullers, and Erik Lochtefeld as W.H. Auden shivering at 7 Middagh. Photo © Joan Marcus. In 1940, George Davis (Julian Fleisher), had a dream of creating a communal hothouse for brilliant talents in a ramshackle Victorian on a Brooklyn hill. Davis,having published a novel to some acclaim, went on to a very luminous career as an editor. 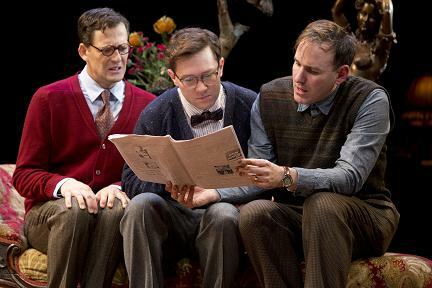 “February House,” at The Public Theater through June 10th 17th, will appeal to lit. nerds and English majors. The musical by Gabriel Kahane (music and lyrics) and Seth Bockley (book), and direction by Davis McCallum, is based on Sherell Tippins non-fictional 2005 exploration of life at 7 Middagh Street, Brooklyn and the ragtag assortment of famous and accomplished intellectuals who resided there. The group included Gypsy Rose Lee (Kacie Sheik) who worked on a best-selling murder mystery while boarding with George. Kacie Sheik as Gypsy Rose Lee at 7 Middagh, Brooklyn. Photo © Joan Marcus. Carson McCullers (Kristen Sieh), just 23 and fresh off the success of “The Heart is a Lonely Hunter,” left her husband, Reeves (Ken Clark), and took up residence. W.H. Auden (Erik Lochtefeld), in a moment of abandon, took a room with his young protege, Chester Kallman (A.J. Shively.) Benjamin Britten (Stanley Bahorek) and his lover, the singer Peter Pears (Ken Barnett) reluctantly decided to join the experiment. Auden worked with Britten and Pears on the opera “Paul Bunyon” at February House. Photo © Joan Marcus. At “February House,” Davis coaxed and coddled his charges. He exerted a flair for the dramatic and decorative, sometimes at the expense of the practical. Life at 7 Middagh Street was never dull, but often it was far from comfortable. There was plenty of booze, but not enough heat; frequent partying lead to missed deadlines. George Davis’ little experiment in communal artistry did not fare well. Gypsy Rose may have been the only one of his tenants to have produced a successful work while boarding with George. Erika Mann (Stephanie Hayes), Thomas Mann’s daughter who was married to Auden, adds a little political gravitas to the house on the hill when she shows up. It is after all the middle of World War II. A highlight of “February House” is the song “California,” sung by the endearing Bengy and Peter; the score successfully blends the post-modern with California pop when the pair of resident Brits announce their departure for Hollywood. The tone of the musical is often wistfully alegiac. Among the charms of this production, along with the cast of fine young performers, is the fact that the characters are both icons and ordinary folk. Next Post What’s In A Name? : "Here I Go" and "Lonely, I’m Not"